Aitken Spence Technologies recently signed off with NMK Holdings, better known as Marina Kingdom of Oils and Fats for the design, supply and installation of Oracle ERP (E-Business Suite R12.2.4) Solutions Software for the manufacturing giant. For the sign-off of the project, several dignitaries from NMK Holdings Pvt Ltd were present including Mr. Manjula Narayana – Chairman, Mr. Manjula Priyadarshana – Group Chief Executive Officer, Mr. Rasika Jayawardena – Chief Accountant, Shantha Haloluwa – Finance Manager and Mr. P.D. Premaratne – Executive Director. 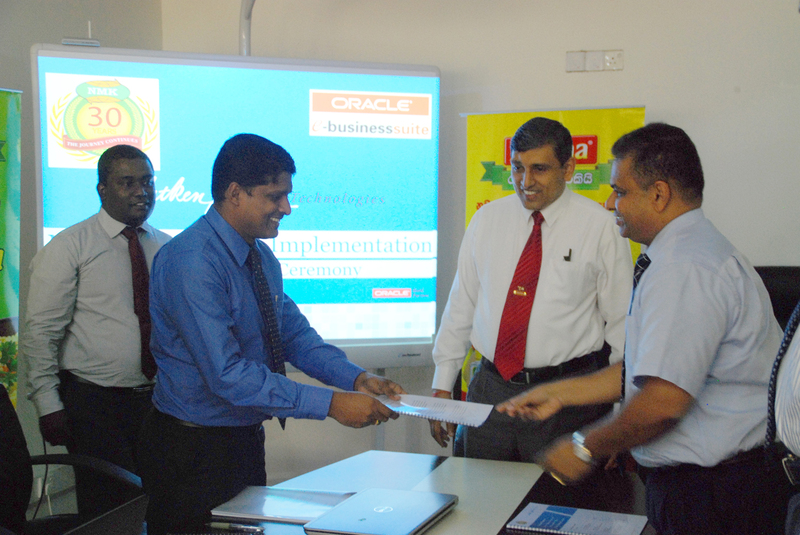 Mr. Vipula Gunatillake – Group Chief Corporate Officer and Managing Director of Aitken Spence Technologies, Mr. Dhammika Dasa – Chief Operating Officer, Mr. Fahad Cader – General Manager and Mr. Amila Shanka Perera – the Manager Delivery – Oracle Applications were present at the signing from Aitken Spence Technologies. NMK Holdings (Pvt) Ltd has been in business in Sri Lanka for the last 35 years. Having multiple businesses in Food Manufacturing, Trading, Supply Change Management-Shipping & Logistics and Non Food categories, the group is one of the largest in Sri Lanka. Under the strong patronage of its Chairman Mr. Manjula Narayana, the company has spread its wings across multi-location factories island wide. While its international trading spreads across 41 countries, its brand Marina is a household name in Sri Lankan. 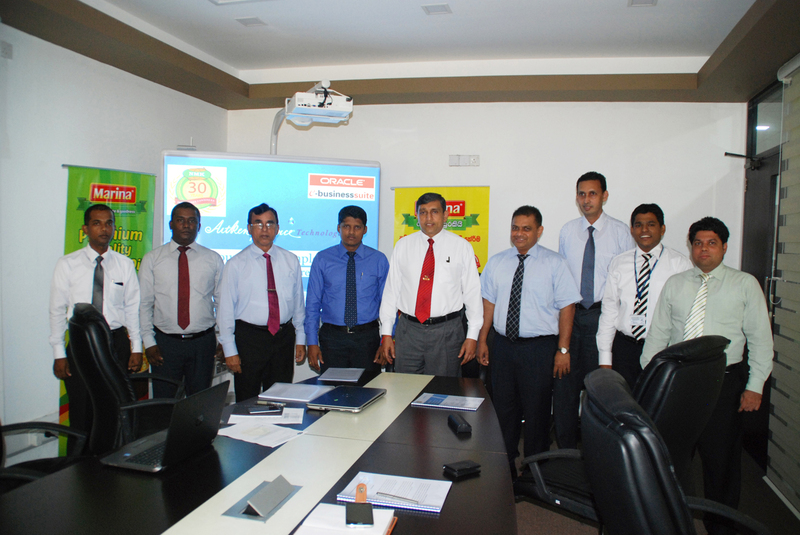 It is with great pride that Aitken Spence Technologies ventures into its first Manufacturing & FMCG industry project. The project is an initiative of the newly appointed group CEO Mr. Manjula Priyadarshana who is driven with the aspiration of taking the NMK group to be a One Billion Dollar company by 2020. Sixteen companies are covered in the project scope, including NMK Holdings (Pvt) Ltd, Cherubium Lanka (Pvt) Ltd, Naratha Agro Industries Lanka (Pvt) Ltd, Naratha Agro Industries (Pvt) Ltd, NMK Agro Industries (Pvt) Ltd, Nara Coco Land (Pvt) Ltd. The project locations will include the Head Office at Colombo 9 and three factories in Kandana, Kurunegala and Dankotuwa. The group wanted to implement a fully integrated Tire 1 Enterprise Resource Planning System which could facilitate the growing business needs, horizontal and vertical business expansions in local and foreign continents. Aitken Spence Technologies moved into the project with the goal of streamlining the company’s business operation through the best practices which Oracle brings in. After the implementation, NMK will have one integrated system for their full supply chain including Imports and exports, FMCG Business and Manufacturing. There are approximately 15 modules lined up to be implemented at NMK Holdings revolving around Oracle Financials, Oracle Supply Chain and Oracle Manufacturing. After the project is completed, NMK Holdings is expected to enjoy many cost reductions through revamped efficiencies through Oracle with the expectation of expanding it to Oracle CRM Cloud. Being a first of its kind for Aitken Spence Technologies, the project will span across 12 months and will widen the customer reach of the company to the Manufacturing sector, in addition to the automobile, banking, port terminal and other industries which the company serves in. Aitken Spence Technologies, armed with 35+ Oracle Consultants, currently has the largest pool of Oracle resources in the country. The Project team for the NMK Group Implementation consists of 10 Functional Consultants, 4 Technical Consultants & 2 Oracle Data Base Administrators. The Solution Architect and the Project Manager will be Amila Shanka Perera, the Manager Delivery – Oracle Applications.